The greatest music producers. And now you too. 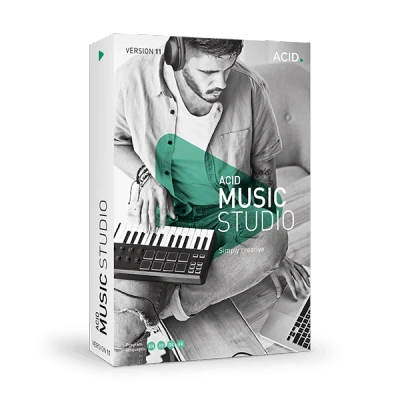 Start your music production easily with loop-based creation in ACID Music Studio. Develop your own, personal style, progress within the ACID family and become one of the greats on the music scene. There are no limits - you have complete creative freedom! Drop the beat, make music. With ease in your own recording studio. Start with some ACIDized loops, edit and make them your own. Choose from over 2,500 loops from genres including hip hop, house and rock. Now add instruments – anything from classic MPC-style beats to rich electric piano. Choose from a wide variety of sounds and even record your own singing. Give your music the professional edge by adding top quality effects, then mix the levels and you're done. It's that simple and now your first song is ready for the world! You're in the ACID zone now and your inspiration takes control! Remix your songs creatively, or import your favorite tracks & add your own flavors. Remix music in your own personal style! The sky is the limit. More tracks, more instruments, real-time effects and more power mean that you can produce music just like the pros. It's the perfect environment for music making. An inspiring and cool-looking studio just waiting to be taken over… by you. Produce tracks in any style you want with brand new drum machines and synths, and with effects including an original guitar amp. A collection of over 2,500 new loops will inspire you to better music making in whatever genre – hip hop to rock, techno to pop. Show me all new features!